Robin van Persie scored a superb winning goal for Feyenoord against Vitesse before being sent off less than four minutes later. Robin van Persie showed both the good and bad sides of his game on Sunday as he scored a late winner for Feyenoord but was then sent off less than four minutes later. The 2017 Dutch champions appeared to be heading to a frustrating 1-1 draw with Vitesse Arnhem at De Kuip and set to lose further ground on Eredivisie leaders PSV Eindhoven. But with three minutes remaining, former Arsenal and Manchester United forward Van Persie stepped up to bend in a free-kick from 25 yards to give them victory. The 102-times capped Netherlands international lapped up celebrations with his team-mates - but his joy soon turned to despair. 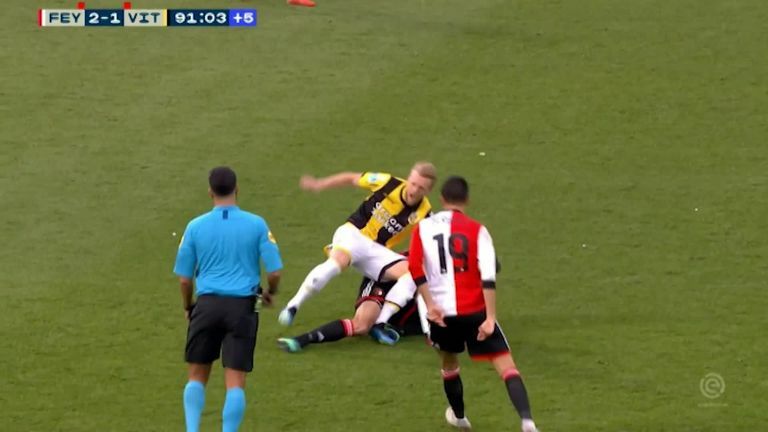 With Feyenoord looking to see out the match, Van Persie tackled English midfielder Max Clark from behind and was shown a straight red card. In turn, he became the first person to both score and be sent off in an Eredivisie game since former Manchester City and Celtic striker John Guidetti in 2012, also for Feyenoord. The dismissal followed another sending off for Vitesse's Thomas Bruns, with away player Danilho Doekhi also making an early exit as the visitors finished with nine men. Van Persie has been offered a three-match ban by the KNVB, Dutch football's governing body, but has rejected that and the issue will now be referred to the association's disciplinary committee. Click the video above to watch Robin van Persie's moment of brilliance, and then despair.